Switch-mode power supplies are used in electronic circuits to increase (step up) or reduce (step down) voltage levels in the most efficient manner possible. Compared to linear voltage regulators, switch-mode supplies convert relatively little energy into heat. Their efficiency is thus high. This is a major advantage with compact power supplies in particular, since it sometimes makes forced-air cooling unnecessary. Building a switch-mode supply is considerably easier if you use components that have been specially developed for this application. One example of such an integrated step-down converter is the Maxim MAX639. 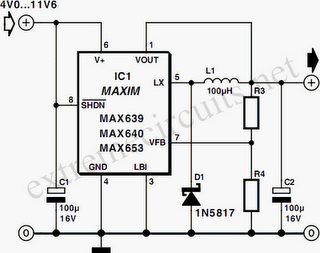 This is designed for a ﬁxed output voltage of +5V, with an input voltage ranging between +5.5 and +11.5V. Although this IC is primarily designed for a ﬁxed output voltage, the output voltage can be tailored using a simple feedback network. With the given component values, resistors R3 and R4 determine the output voltage, with R3 = R4 [(Vout / 1.28) – 1] The value of R4 may lie between 10kΩ and 10MΩ, but a value of 100 kΩ is a good choice for most applications. The maximum output current is 100mA. If desired, a different type of Schottky diode with similar specifications can be used in place of D1 (a 1N5817). Inductor L1 must be suitable for a maximum current of 500mA.